NMRFAM is leveraging its existing inventory of metabolites to develop an NMR-based high-throughput ligand screening platform. Identification of binding interactions can lead to functional assignment of orphan proteins, identification of allosteric interactions, or establishment of drug leads. 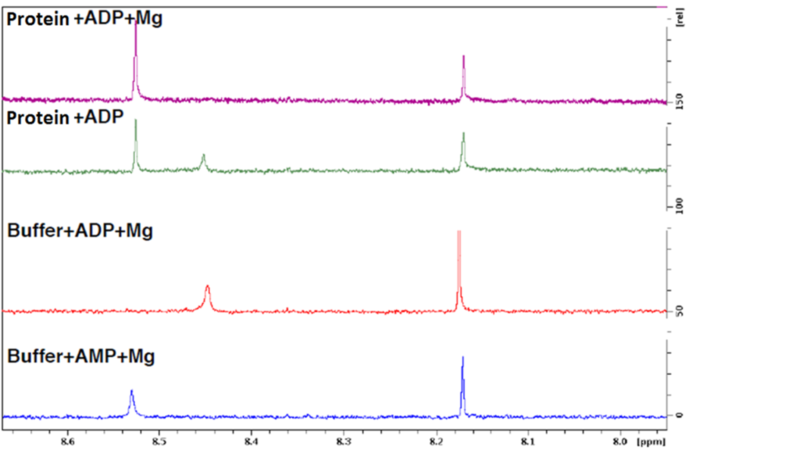 The primary screen uses 1D proton (1H) NMR spectroscopy to observe signals from the metabolite in the presence and absence of a protein or other biomacromolecule. Changes in the spectrum of the small molecule (e.g., peak broadening or loss of intensity) in the presence of the macromolecule reveal binding. If the metabolite is chemically modified by the macromolecule, its pattern of chemical shifts will change. At left, a protein supplied by the laboratory of Dave Pagliarini (University of Wisconsin-Madison) was shown to convert ADP to AMP, a reaction that accelerated when magnesium was added. The advantages of this NMR technique is that no labeling or biochemical assay is required and that relatively weak binding interactions can be detected. 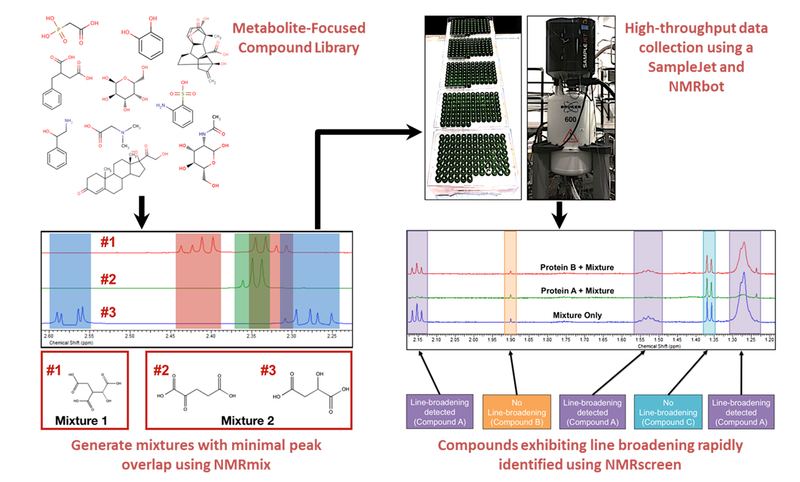 Efficient screening is accomplished using in-house developed NMRmix software to design mixtures, each containing 4-5 compounds, with minimal peak overlap as determined by reference to 1D 1H NMR spectra in the BMRB metabolite library. NMRbot software handles automated NMR data collection. NMRscreen software (in development) analyzes the data to identify bound ligands. These technologies enable the screening of a macromolecule or complex against ~500 compounds in a single day. The amount of protein required is on the order of 3‒5 mg. When possible, hits from this screen can be confirmed by collecting two-dimensional 1H-15N NMR data from the protein labeled with 15N. Signals perturbed upon the addition of ligand can identify its binding site (at right, protein supplied by the laboratory of Gaya Amarasinghe, Washington University, St. Louis). For larger proteins (up to 150 kDa), the approach is to label methyl groups of the protein with 13C. 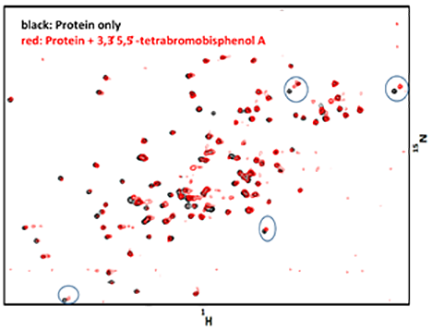 The methyl signals tend to be sharp (very large proteins may require a background of deuterium labeling) and can be followed by two-dimensional 1H-13C NMR. The current library consists mainly of known physiological substrates, products, cofactors, and allosteric effectors, supplemented with some drug-like compounds and potential environmental toxins. In addition, binding of metals including calcium, cobalt, chromium, copper, iron, magnesium, manganese, molybdenum, nickel, selenium, and zinc can be evaluated by Differential Scanning Fluorimetry. The compound library will soon be expanded to more than 1000 compounds.